He’s not bad. But also not great, and certainly not served well by Almond’s decision to seemingly haphazardly use voice-overs for some parts of soliloquies, and spoken performances for others. His performance hits a high point at the “sleep no more” section of the post-murder scene with Lady Macbeth, filled with a self-loathing that seems to grow more tired with every word. On that note, Caldwell’s Lady M is solid, especially in her arguments with Macbeth; there’s a real give-and-take there, with her responding to his every evasion. She does something interesting in the “unsex me here” speech, including pouncing on that word “here”…as if had she not been in her own home, she would have never done it. She’s got the home court advantage and it shows. That’s not to say that all goes right: being an early TV capture, it’s got that bad kinescope look-and-feel; clarity would have been awesome, given the shadowy, angular set design. There are some technical issues that come with the seemingly live production (a boom mic’s shadow appears more than once, and sometimes the actors move out of frame). Such issues are not an issue with the Shakespeare’s Globe production capture. They’ve got their tech down. The leads were solid if not mind-blowing (Samantha Spiro’s Lady M is not quite as successful as her Kate in The Taming of the Shrew). The fight at the end is nicely thrilling, and they find the humor in many of the scenes (including the banquet scene). Here, the witches are eerie (as opposed the seemingly really happy ones in the 1961 version), and the sequence with the warnings is nicely done. Director Best has found a way to make the weird Act Four, Scene Three scene between Macduff and Malcolm work: here, Malcolm is obviously an intellectual, an observer. So it makes sense for Malcolm to try to play mind-games with and test Macduff. The 1961 version’s solution is simply to cut much of the scene (of course, there’s quite a few cuts to get it down to the 80 minute running time, including jettisoning the third of the warnings, and the pre-killing meeting with the murderers). Milson doesn’t blow me away, and the Connery version does have its charms, so it’s a tough call. 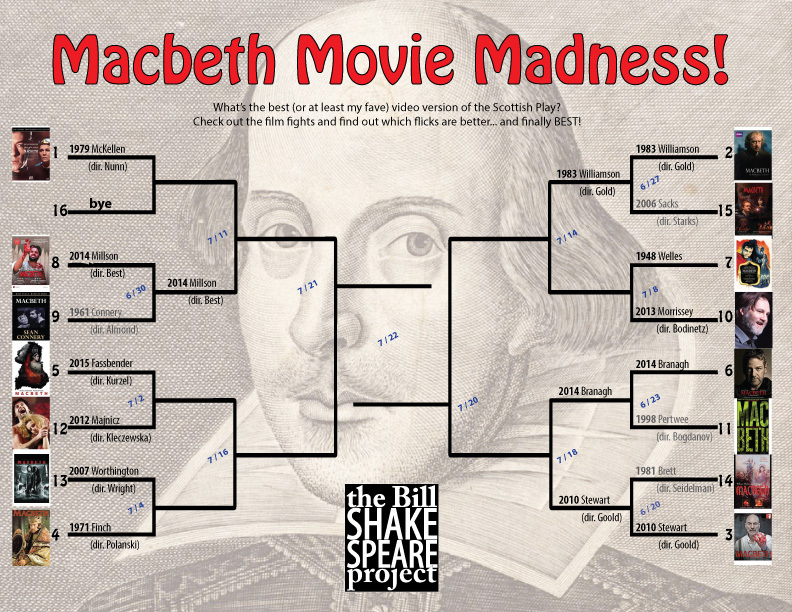 But the call does go to the Shakespeare’s Globe production, in a close one (as befitting an 8 vs. 9 match-up).